Manila, Nov 13: US President Donald Trump, known for his awkward and at times aggressive handshakes with fellow world leaders, struggled during a traditional group handshake at the Association of Southeast Asian Nations (Asean) Summit here on Monday. Trump was befuddled during a group photo when the world leaders were instructed to take part in the "traditional" Asean handshake. During the handshake, the leaders cross their right arm over their left and grasp the hands of the fellow participants on both sides. However, the US President seemed briefly confused by the announcer's instructions and proceeded to cross his hands in front of him, the New York Daily News reported. Then, he turned to the leaders flanking him -- Vietnamese Prime Minister Nguyen Xuan Phuc to his right and Philippines President Rodrigo Duterte to his left -- and extended his arms outwards. But that wasn't right either. Finally, Trump crossed his arms correctly and vigorously shook the arms of the two leaders beside him, while laughing. Photos showed Trump alternatively grimacing and chuckling as he jockeyed for position with Duterte, the event's host. The US President has long struggled to shake hands with world leaders without making it an international incident. The photos of the Manila event made it soon to Twitter where Trump was mocked. "President Trump positioned next to President Duterte for class photo including @ASEAN2017 handshake, which took some twisting," one user tweeted. "Trump's face in this photo is priceless. He struggled a bit with the cross body handshake. He eventually got it and laughed off the awkwardness," said another tweet. "Guess he never played twister? 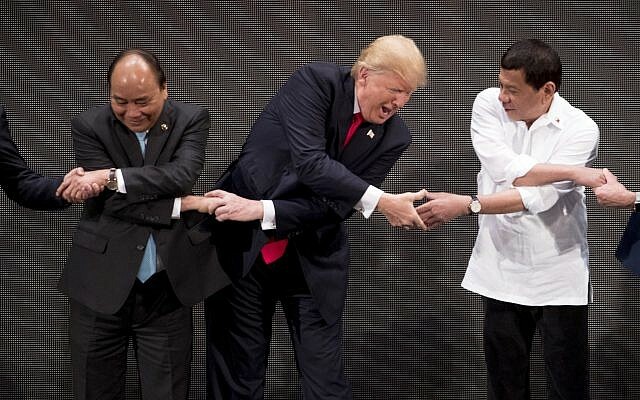 In Asia, Trump briefly baffled by group handshake," another Twitter user said. In February, Trump greeted Japanese Prime Minister Shinzo Abe with a handshake that lasted 19 seconds, included two firm pats from Trump on the back of Abe's hand, and ended with the President declaring, approvingly, "strong hands". He also fumbled handshakes with France's Emmanuel Macron and the First Lady Brigitte Macron earlier this year.